The word fascism has been in the news a bit this last week. Tom Laughlin, the actor who famously roundhouse kicked a dirty politician from a foot away in the movie Billy Jack, died last Thursday. One of the laments of the politically active Laughlin was the fact that the word fascist has become so poisoned, that to utilize it in conversation would often get one labeled a nut. Of course this is only true if you are utilizing it against a liberal or Democratic Socialist. George Bush was called a fascist by left wing activist and Hollywood types (often one in the same) almost as a matter of routine. To the vast majority of people the term is a reference to an archaic and best forgotten form of governance, one that few seem to understand much about. The truth is fascism is not dead but has merely morphed into a more modern form. As the old fascism died out the left picked over its bones, discovering in its demise their future. Stripped of its nationalism, fascism became Democratic Socialism and laid the foundation for economic reforms of the left worldwide. Corporatism, the economic heart of fascism, is the belief in central government economic control by directing and involving unions and corporations in the decision making. Small businesses and individual entrepreneurs are the bane of planning and therefore of no use in corporatism. Only big corporations and labor matter as well as the banks that finance them. Born of socialism with Marxist roots, fascism created corporatism. Today, while it is not usually called by its name, it is the elitist answer to the messy and unworkable dogmatic socialism of the twentieth century. President Obama is often called a socialist, an honest mistake, but his politics are of a much more sinister sort. A corporatist through and through, his vision for America is one much different than what exist today. In Ed Klein’s book, The Amateur, he describes how President Obama believes the economy should be run by corporate boards made up of big business and unions working under the umbrella of the government. The economist Thomas Sowell also has pointed out the fascist roots of Obama’s economic polices. Even the Democratic governor of Montana, Brian Schweitzer, has called out the President on his corporatist views. Given this it should be no surprise that ObamaCare follows a fascist/corporatist model. Of course America is not the only place where fascist economic policies are being implemented, European governments are wrestling with it as well. For some, like Greece, it is callous struggle between old nationalistic fascism and the kinder modern EU version. 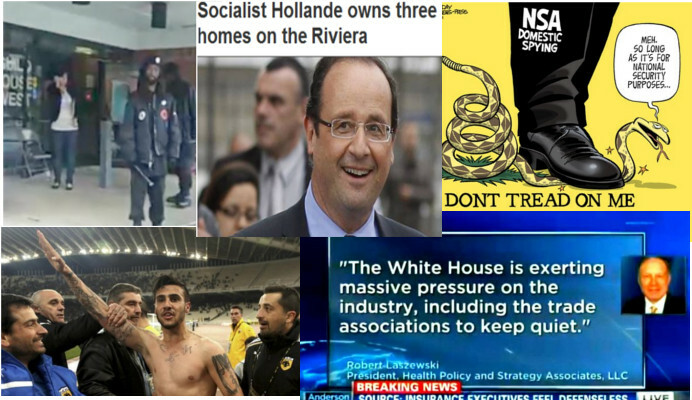 Others, like France, seem to want to lay a governmental whip across corporate backs to prove their socialist metal, but they are still corporatist in spirit and practice. The new fascistas may be hollowed out replicas of the originals but their vision of how the world should be run is pretty much the same. Creating a caste system of have’s and have nots, where they are the haves and the rest share in a more equally spread misery. In their vision of the future, social mobility becomes a fantasy best not dwelled upon. Freedom in their brave new world is merely a buzzword, often quoted but devoid of meaning. A world ran by a new kind of artificial aristocracy where every peasant knows his place. The words may seem harsh but reality is even more so. The proof is all around for those willing to open their eyes and see. Regulations now virtually assure new car companies, banks and energy companies can’t be formed by individuals unless the government deems it so. Corporations are being told what they can say and how to run their companies. An atmosphere of uncertainty pervades the marketplace as winners and losers are picked by politicians and bureaucrats. Unions, for their part, are given special allowances and exemptions like never before in exchange for their loyalty and souls. As far as small businesses are concerned, they are being shoved aside and their seat at the table has been removed. In contrast, corporate heads and union leaders are regular guest of the White House and not unknown to leaders of most EU countries as well. Increasingly for the common man, his life is not his own; the state is taking over his right to make mistakes (at least in the eyes of ruling class). The transformation is not compete to be sure but the destination of the current path is unmistakable. A government directed corporatist hell where there is one law for the elites and another for everyone else.